Davis Global Fund: Selective. Attractive Growth. Undervalued. Davis Global Fund is a portfolio of attractive businesses from around the world, selected using the time-tested Davis Investment Discipline. 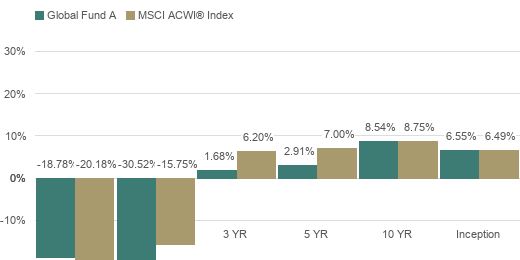 The Fund has outperformed the index since its inception in 2004 and has lower than average expenses. Davis is one of the largest shareholders of the Fund. Signature Davis Investment Discipline: Utilizes a time-tested strategy that has successfully compounded wealth for more than 45 years, in both U.S. and non-U.S markets. Focuses on identifying attractive businesses with sustainable competitive advantages and experienced managements, selling at a discount to their true value. A Flexible, Opportunistic Approach: We believe that a bottom-up stock selection process, and not mirroring the benchmark, are keys to long-term outperformance. The performance presented represents past performance and is not a guarantee of future results. Total return assumes reinvestment of dividends and capital gain distributions. Investment return and principal value will vary so that, when redeemed, an investor’s shares may be worth more or less than their original cost. The Fund is subject to a 2% short-term redemption fee for shares held for fewer than 30 days. The total annual operating expense ratio for Class A shares as of the most recent prospectus was 0.96%. The total annual operating expense ratio may vary in future years. Returns and expenses for other classes of shares will vary. Current performance may be higher or lower than the performance quoted. For most recent month-end performance, click here or call 800.279.0279. Applying the Davis Investment Discipline to companies within the United States and around the globe; Portfolio characteristics, top holdings, and performance. Portfolio Manager Danton Goei discusses the Portfolio, performance and how he applies the Davis Investment Discipline to uncover opportunities around the globe. Our companies are rigorously researched, offer attractive growth and yet are significantly undervalued versus the benchmark – A powerful combination. PM Danton Goei on what has driven the outperformance of the Davis Global Fund,^^ where we are finding opportunity and how investors use in their allocation. This material must be accompanied or preceded by a current Davis Global Fund Prospectus. You should carefully consider the Fund’s investment objective, risks, charges, and expenses before investing. The prospectus contains this and other information and can be obtained by clicking here or calling 800.279.0279. Read the prospectus carefully before you invest or send money. 1 Class A shares without a sales charge. Past performance is not a guarantee of future results. 3 As of December 31, 2018. This includes Davis Advisors, the Davis family and Foundation, our employees, and Fund Directors. 4 See Expense ratio/Turnover link below. ^^ Class A shares without a sales charge. Past performance is not a guarantee of future results.